Are University sides weakening the National Leagues? Unlike our American counterparts in the world of Basketball and American Football, our structured institutions of Higher Education afford the best student athletes in the country their own competition mid-week before their integration with the rest of the hockey pyramid on a weekend. Inevitably, with such a plethora of elite junior international talent available on a yearly basis, some of those institutions find themselves at the top-end of the domestic game. Having played in BUCS for the University of Birmingham, a perrennial top-four (university) side in the men’s game, there’s no denying that University Sport is a great place to play against some of the best young players around; all honing their game. Throughout my three years, we fell to Dan Coultas and Durham, Phil Roper, Brendan Creed and Sheffield Hallam and then Chris Griffiths, Ian Sloan, Harry Gibson, Jonty Griffiths and Luke Taylor at Loughborough. They are all now current Senior Internationals and are either currently, or have been, involved in the GB Centralised Programme. Top-end University Hockey is no easy feat to conquer. But is it enough to move forward and conquer the domestic game? The flagship sides of recent years in the context of the National Premier League have undoubtedly been Loughborough Students and the University of Birmingham. Fleeting visits from Exeter University and Sheffield Hallam on the men’s side were ultimately too tough to maintain amongst the nation’s top 10 sides whilst UoB have enjoyed unrivalled success under the steady tutelige of Phil Gooderham. The truth is that Loughborough Students’ quarter-final effort in the European Hockey League in 2008 is the last time an English University side made their footprint across the continent in this manner. University of Birmingham reaching the playoff semi-finals last season was a fantastic achievement yet often, these sides are the victims of their own success. With often a number of junior internationals in their midst, a single tournament, series or training camp can decimate a squad. This was never more evident than during the recent women’s Junior World Cup in Santiago, Chile at the end of 2016. Birmingham had provided an incomparable 9 athletes to the tournament, and were then expected to pick up points in domestic competition in their absence. Having spoken to Phil Gooderham in the week before their rearranged match at Bowdon Hightown, actually being able to field a side was a genuine concern. 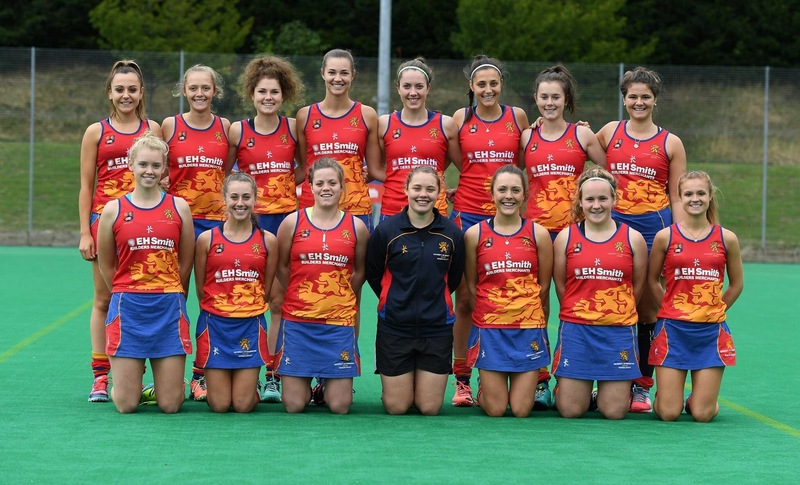 Phil Gooderham’s University of Birmingham side provided 9 athletes to England’s Junior World Cup campaign in Santiago, Chile at the end of 2016. That isn’t to say that those clubs at the top end of the league are unfamiliar with situations such as this. The Hockey India League currently running takes the talismanic Adam Dixon away from Beeston for the first few games of the second half of the season whilst Holcombe are left without the irreplacable Barry Middleton and Iain Lewers. There’s no doubt that sides in the bottom half will also be licking their lips at the prospect of the Great Britain training camp that is scheduled to take place in South Africa in the middle of the domestic campaign. The top sides will have to look exclusively to their depth in order to pick up vital points in a crucial stage of the season. For those sides without senior internationals in the Great Britain squad, they will look to target the likes of Wimbledon, Surbiton and Holcombe in particular who will find themselves extensively depleted before the end of the regular 2016/17 campaign. In spite of the obvious distractions that accompany the inevitable international commitments, there are considerable benefits to the involvement of University sides in domestic competition. Most elite Hockey Univirsities in the country receive extensive funding. As such, student-athletes have unrivalled access to elite training equipment, coaching, nutritional support and programming. Obvious stereotypes aside, most in that environment have the opportunity to border on training full-time. Living and training with your team-mates serves in providing an altogether unique dynamic. Undoubtedly there can be times when it can become all-consuming or overwhelming, but the high contact time, not to mention the well documented ‘extra-curricular activities’, creates a bond and unity often unable to be replicated in a club environment. In spite of the access to (more often than not) greater training facilities and opportunities to that which is afforded to the common Premier League outift, there are a number of factors that count against University sides; often with a devastating effect. The sleep/work balance is irrefutably impacted and plays an integral part in restricting the physical development of players and their subsequent sides’ performances. The well versed dietary recommendations from the elite sports centres often fall on deaf ears in the early hours of Thursday mornings, as well as simply being unaffordable to the regular student. The ever-increasing workload of the modern youth hampers the hockey development of an indivudal but rightly takes priority in the context of pursuing a career for life given the limbo of (semi) professionalism that surrounds our sport. When the travel accompanied with the top tier (let alone in the regionalised conferences) is added to the mix, ever-decreasing enthusiasm for the regular tours of England’s motorways is inevitable. In an attempt to supress my Redbrick roots and a well-versed song or two that remain ingrained within me, suffice to say that these workloads fluctuate from establishment to establishment. But the commitments and priorites still exist nonetheless. These priorities during the context of a season no doubt contribute directly to the erratic performances and form guides that accompany almost every University side throughout a regular season. One of the biggest influences to the success of University sides is the regular turnover of students. With most opting for three year courses, that gives a minute window of opportunity for a coach to mould together a side worthy of challenging at the top level. The notion of being promoted to England’s highest tier then would inevitbaly lead to a number of key players having to leave, often for immediate rivals on the club scene. Add to this a disrupted pre-season, uncertainties of squad additions until late in the summer when A-levels are anxiously received and a plethora of other distractions and you see just how difficult it can be to mould a top tier side. All of this makes the work of Phil Gooderham at the University of Birmingham even more remarkable. So with the exception of the University of Birmingham, just why are University sides struggling to compete in the National Premier League? Let’s take a moment to play devil’s advocate. I am very aware of the demands on individuals in the ‘real world’. There are a plethora of responsibilities, both professional and personal, that demand time, focus, finances and effort; all hampering potential physical development in the context of Hockey performance. Accompanying this often resented progression into the adult world however is a level of maturity previously absent. Ironnically attributable to the time spent at University, it remains evident in life both on and off the field. And therein ultimately lies the difference. In the same way that a rookie fresh out of college will struggle to find their feet in the professional league, a team of student athletes will struggle to matchh their more experienced and mature counterparts on a basis regular enough to succeed. Don’t get me wrong, University sides can still compete in the greater National League. Although Loughborough Students are struggling in their return to the top flight thus far, regular powerhouses Durham University, Sheffield Hallam, University of Birmingham and Exeter University are competing at the top end of their respective conferences (with an honourable mention to Bristol for their first ever campaign in the National League). In the women’s game, University of Birmingham stand alone at the top of the pile, sitting just two points off a playoff birth in the Premier League, whilst Isca University and Loughborough Students enjoy mid-table security in their conferences with Durham currently sitting in third in the North. All of this adds up to a similar tale in recent years; Good, but not good enough to challenge. The well-versed gap between conference and Premier League provides a difference far greater than simply positions on the Hockey ladder. With the top Premier League sides now littered with senior internationals, the likes of Phil Gooderham’s Birmingham challenging the playoff spots at the top of the English game is sadly the exception rather than the norm and a trend that looks unlikely to change in the near future. I always have done and always will love playing against Students. There’s a refreshing enthusiasm that accompanies the energy they put into their performances and a challenge that becomes very difficult to replicate in any other environment in the context of a league game. Whilst University sides remain integrated, BUCS will always be the priority. It’s unique for them and the field of competition is reduced. It is an exclusive club to which only a select few receive an invite into the Wednesday post-season. Such an experience and with such a small time and finite window in which to succeed will naturally take to the fore for the majority to the detriment of their respective National League campaigns. With the quality of players available throughout the junior international set-up and with many often coming to University with extensive National League experience, competing in the Conferences is a given. So naturally, the National League’s are strengthened with the inclusion of Universities. That next step up to the Premier League however is a completely different ball game and one that, in recent times, very few University sides have been able to play.